Fans are no longer waiting to discuss the latest show the next day at the office water-cooler, or call their friends during the commercial breaks to comment. It’s now all about real time engagement while the show plays out live on the television. More than 65% of the 14 year old to 23 year old viewers watch television while simultaneously interacting with their iPad, smartphone or laptop – the “second screen”. Television networks are looking into how to retain viewers and have them watch programs as they are broadcast, rather than time-shifted with a DVR (Digital Video Recorder). Real-time social media interaction has made television more engaging by enabling viewers to share their thoughts with everyone, and have everyone share back with them. Television is no longer a one way medium. This approach has been successful for live events such as Oscars, Grammys and the Super Bowl. It has also been popular for many competition and reality shows – American Idol, X-Factor and Dancing With The Stars (DWTS). Surprisingly for the networks, fans have taken to social media in astounding numbers during serialized programming as diverse as Vampire Diaries, Downton Abbey and NCIS. Facebook was the first social media giant to take advantage of this trend. Understanding that television is monetized through the advertisements, Facebook began offering video-ad spots to the broadcast advertisers that targeted the same viewer fan base commenting on the show while watching. For some advertisers this enabled them for an incremental cost to double their exposure by running advertisements simultaneously on television and Facebook. The networks are also experimenting with how to keep viewers locked into their own ecosystem. “Character Chatter” is a platform developed by USA network (a Comcast subsidiary) allowing comments related to a show while it’s airing. The platform was expanded to include a complete dashboard which also captured comments from other sources, such as Twitter. As a real time interactive application, the “Character Chatter” posts were topping 30,000 as each episode was aired. With its short format and easy to use interface, Twitter has become the platform of choice for real-time sharing during air time. This has created a world-wide, or at least time-zone wide, audience for viewer comments and gives fans a reason to watch shows as presented by the broadcasters. The fact that we have 95% of the public conversation around television supports the fact that we are the de facto second screen. What our partners do is completely up to them. Twitter also understands the value of this interaction and the potential for advertising revenue. Recently, Twitter purchased “Bluefin Labs” for almost $100 Million. Bluefin Labs analyzed the interaction of social media with television viewing, and used that information to advise advertisers and content producers on market statistics. Twitter has also entered into partnership with television ratings pioneer Nielsen to develop a ” Nielsen-Twitter Rating” system. 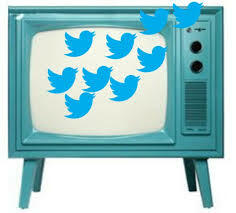 Twitter has become so much a part of the television viewing experience that hashtags are showing up everywhere. Advertisers display hashtags along with their commercials; Networks show them with their badges during the program; Hosts and presenters work them into the monologues and introductions; On stage guests have even flashed them on signs during acceptance speeches! With the nearly ubiquitous integration of Twitter with television, it will be interesting to see what the next step will be for both social media and content providers. Perhaps this means the viewers will have more say in which shows are renewed or cancelled. This may also start a new genre of crowd-sourced entertainment. Tweet your views on this to #TwitterTV . You can download popular Twitter videos to iOS devices with Twitter Video Downloader.